Unicom bought the rights for the design for the good old fashioned (and noisy) IBM Model M, and I used to have one at the office. Now I have a man cave, I don't care that anyone else thinks my typing is too noisy - the Filco keyboard is almost as good, but the model M is the keyboard I have always liked. 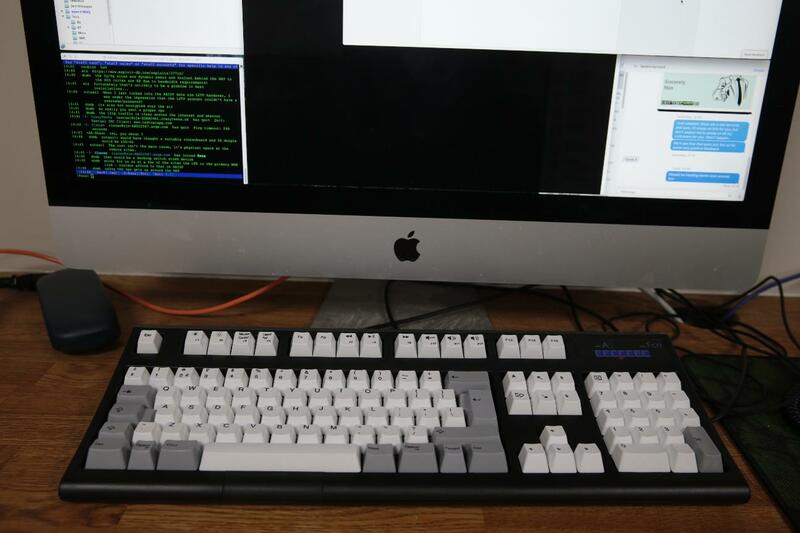 What I did not know is there are now UK suppliers selling the Unicomp keyboard rather than having to order direct from the US, and that they even stock a Mac version. No more printing a replacement key to lose the windows advert on my keyboard. And it works - and all of the keys are the right letters - even the never used § symbol - yay! Nice! I have a model M gathering dust in a cupboard because I can't really use it anywhere. I see the endura pro model (the one I'd theoretically go for, with a tracepoint) is pricey at about £120 inc VAT. I've opted for a couple of modern-ish (albeit still IBM era) UltraNav keyboards, which are not buckle spring by any means, but pleasant to type on in a different way, have trackpoints, are quiet and easy to stow. When mine died, I went with a 'das Keyboard' (http://www.daskeyboard.com/) which I find feels like the M, but has more gizmos! I'm reminded I need to respray my model F to match my iMac. They were quite cheap on eBay not long ago, and they really do make Model Ms feel like spongey rubbish, if you can believe it. Love the model M. Even bought HRI'd "U" and "H" keys and plain "F" and "J" for mine, for the reshuffle to Dvorak. (bought three lots, but only one keyboard yet). Only annoyance for me is that they don't do a "penguin" key to replace the Windows logo keys. Got three here. One came from a boot sale attached to a PS/2. Slung the PS/2, kept the keyboard. Relatively recent vintage (1990) UK spec. Also acquired two more off eBay for silly money, one with a couple of missing keycaps, each for under £10 inc postage (which given the weight and Royal Snail's current rates, would be difficult to achieve these days). Two have the removable (and ridiculously long by modern standards) cable. Keep watching eBay, someone will be chucking one out especially when they don't know what they are, and can't find a PS/2 port on a lot of modern kit. Personally I can't stand the noise of anyone typing on a Model M anywhere near me. Instant concentration destroyer. Do you all work alone to be able to use one? I am using one to type this, 1988 vintage. It was attached to my first computer at this company a PS/2 Model 50 and I've kept it ever since. The right hand shift key sticks down occasionally, particularly on warm days, but other than that's still working well. I have half a dozen at home, bought from second hand computer shops a decade or more back for £2 or £3 each. Like someone else said above, they will have to be clawed from my cold dead hands. What could happen next after #IPBill? What is an "Internet Connection Record"? What privacy can we promise you?